Frank is very pleased to offer this superb Grandfather clock by Kieninger of Germany, you can be sure that Kieninger´s high standards provide an assurance of quality even at the relatively modest price. The 0131-23-01 is in a Walnut finish, the cabinet is constructed in a combination of solid timber and matching veneered panels and finished in a pleasing satin lacquer. The cabinet has an two opening glazed doors to access the pendulum and the dial and there are also two removable panel to access the sides of the movement.. The 0131-11-01 is fitted with the Kieninger SK 015 8-day running movement which plays the Westminster Melody, on the quarters and strikes the Hours on an eight-rod gong. The movement has an automatic night-off mechanism to silence the chimes between 10pm and 7am and it can be completely silence. Three brass weights suspended on chains provide the power to drive the hour striking, the Westminster chimes and the Pendulum; these need to be raised every seven days. 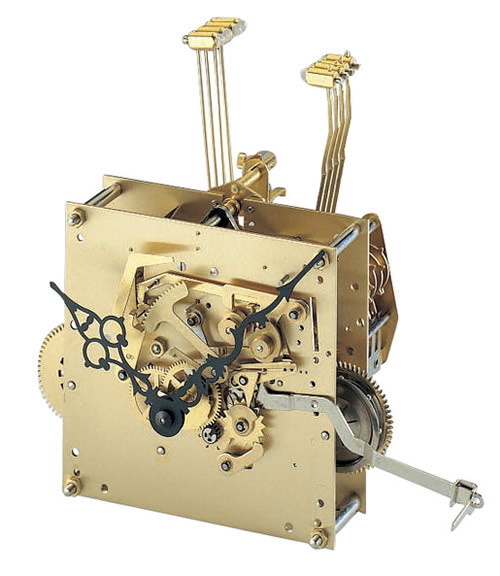 The clock is fitted with a small lyre pendulum with a 140mm brass bob. There is a knurled nut below the pendulum bob to adjust the time-keeping. SK 015 1/4 chain and weight Westminster & striking movement. Kieninger SK 015 1/4 chain and weight movement with an eight-rod gong.